On the golf course, or during any adventure, you never know when an accident may occur. You never know fully when you may get a cut, scrape, or even have allergies or touch something dangerous. With that in mind, an emergency kit is one of the most crucial items that an individual may need on the golf course or in general. As the next topic that we want to discuss with our audience, we not only want to shed light on the top ten first aid kits on the market today but also some emergency preparation tips for golfers. To ensure that you are being safe on the golf course, it is important to read the proper guidelines and golf rules for each individual course. Part of the guidelines may be that you have to wear strict and specific shoes designed for the golf course or specific gear. Moreover, to protect your feet from blisters, discomfort, or potential straining, it is important for you to wear the proper shoes. Now, in the case blisters or straining comes up, or worse a cut or a bruise, you want to make sure you have an emergency kit in your golf bag. Trust us, the last thing you want is a blister or cut while trying to sink a putt. As the product on our list, it is important to mention that this product is not only crucial for the golf course, but for any outdoor sport or adventure. Whether you are going running, hiking, or even camping, this product is crucial. With this, it is time to share what is universally known as one of the most common kits in the industry. 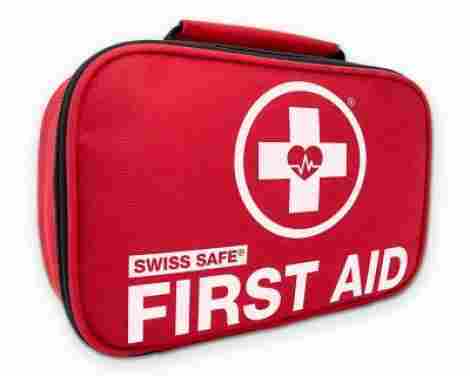 This is the First Aid Only kit and here are two awesome benefits to consider. This product comes with 299 physician-recommended supplies. 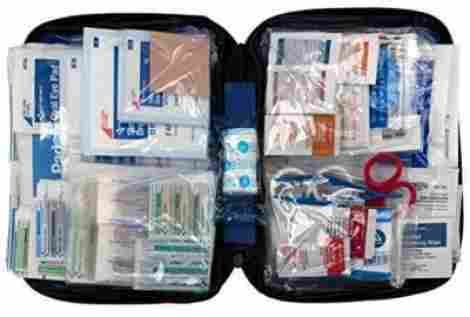 In fact, it comes with everything that an individual will need in the case of an emergency from medicine to antiseptics to bandages and more. With this, it comes with injury treatments, sewing supplies and a lot of other important items and products. This item is designed with a highly durable tote bag. The tote bag is made of vinyl and happens to be a softback that can easily be stored in a car or packed away during travel. With this, golfers may want to consider using the tote bag and placing it inside of their golf stand bag or golf duffel bag. With that said, it is very high quality and designed to be wear and tear resistant. As far as the price for this item, preparing for emergencies has never been cheaper and more effective. This item is a bit above ten bucks and individuals will enjoy the fact that it comes with many handy dandy products. Overall, the design, the kit, the case, and everything that is included is considered a value pack in our eyes. We highly recommend it considering it has flawless reviews. Contains plenty of important supplies. Full-fledge design and easy to use. Perfect for a car, home, or backpack. 4.5 starts and over 3k reviews online. The tweezers are very cheap and made of plastic. The scissors do not cut well. The next first aid kit on our list is from the Swiss brand. This brand has long been known for their premium products, well-designed kits, and overall customer satisfaction. Therefore, we are eager to learn about how high quality this item really is. To start, this is the new and improved 2018 version and it comes as a 2-in-1 kit with medical grade products. Let’s discuss the first benefit. The first design benefit of this product is the fact that it is FDA approved. With that, users can expect the contents and material to be a high-quality blend of durability and satisfaction. Alongside this, they are designed to be for emergency use and this kit comes with a large selection of multipurpose items from bandages to alcohol pads that allow for you to be the hero in the case any emergency situation arises. The kit itself includes 32 medical items alongside plenty of other important pieces of equipment and gear. For instance, it comes with scissors, tweezers, a compass, and much more. With that, this product has a 100% money back guarantee and 100% customer satisfaction guarantee. So, if you want a quality product from a brand that excels in design and quality, this is the kit to consider. It also is designed as a lightweight carry case that can be perfectly stored anywhere. As far as price, it is a bit more costly than other brands due to the fact that the carry case is a multi-purpose case and this brand's overall quality for individual products is much better. With this, the upgraded case is a quality case with plenty of medical grade items that are durable and great for emergency use. You will get your money’s worth with this kit. Plenty of durable parts and quality emergency equipment. Individuals feel it comes with too little. Not enough bandages or tapes. This next kit is an even bigger upgrade from the two we just shared. If your primary concern is durability and wear and tear, this is the kit for you. The reason being is that the case is a high class and high-quality 600D polyester case that is designed to last. In fact, it is one of the strongest materials available today. With that, the Surviveware Small First Aid Kit has many other features worth considering. This product is compact and very lightweight. It also is portable and designed to last. This high-quality kit comes with 100 essential basic life-saving pieces of equipment that total about one pound. With this, the overall compact design is all kept in a small carry case with a compatible strap that makes it easy to carry. To add to the durability, the bag is even water-proof and made from an inner laminate material to protect from moisture. One of the even better benefits of this product is that it comes fully organized. Not just organized for easy carry, but it happens to be organized with labels in their proper sleeve according to the function of the items. With that, during any stressful moment, an individual can simply retrieve what they need and then replace it afterward in an orderly fashion. Before we talk about the price, this item happens to have over 1.1k reviews and a full five stars! Yes, this item is virtually flaw-proof and individuals have mentioned the benefits to range from easy to carry, to waterproof and many more. Overall, this product is very high quality and worth considering if you want a simple design for at home or work. The price is a bit above the average price for a kit, but even the scissors or made of stainless steel. So, you are getting a class-A product! Each inner sleeve is organized by category. Easy to carry trap included. Lacks a couple of essential items. As the next kit for our audience, this item is designed with a duffle-like carry bag that is very high quality and durable. From the M2 brand, we want to discuss the Basics kit. This product comes with 300 essentials that are all FDA approved and designed for convenient and quality use. What can individuals expect from this product? Stay tuned to find out! This product comes with a lightweight and durable carry case. The carry case happens to be a quality case that is designed with a zipper for convenient storage and even clear pockets for organization. Take it on the go or use it during emergency moments, the case is always there for you if you are looking for durability and convenience. 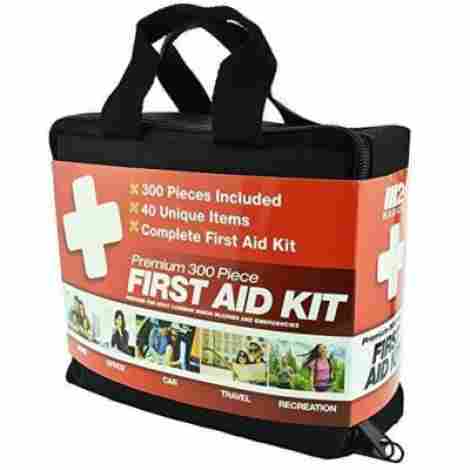 This product is a 300-piece kit with over forty unique items that are all highly beneficial in the case an emergency arises. For instance, this kit includes eye pads, sterile sponges and rolls, alcohol wipes, instant cold compress, medical face mask, scissors and tweezers and much more. To add to this, the whole set is packaged very well and organized. As far as the cost and value for this set, people can expect the set to be lightweight, durable, high quality and versatile. With this, the overall design is intended to fit your lifestyle and can be taken easily anywhere. The cost for this item is average and shy of thirty bucks. Now, it is currently on sale, because regularly it is a bit costlier. Quality set with plenty of important items. 300 pieces of exclusive and important items. Protect your family and friends. Includes a lightweight and durable design. The carry case is convenient. The band aids do not stand against water. Does not come with burn cream. This next kit is for individuals that are looking for a specific design. 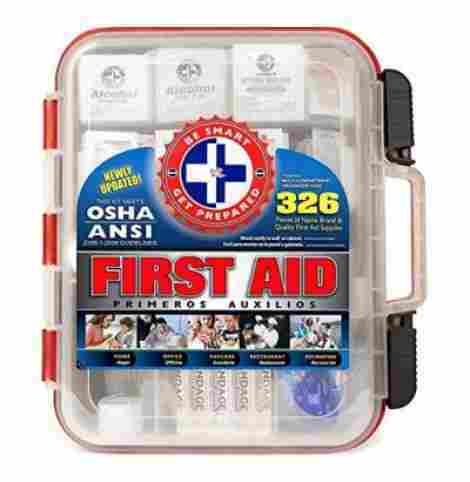 It is organized very well and the overall design has over 326 pieces of comprehensive first aid products that are highly important in emergency situations. With this, it meets the OSHA and ANSI guidelines and it is designed for both adults and children. 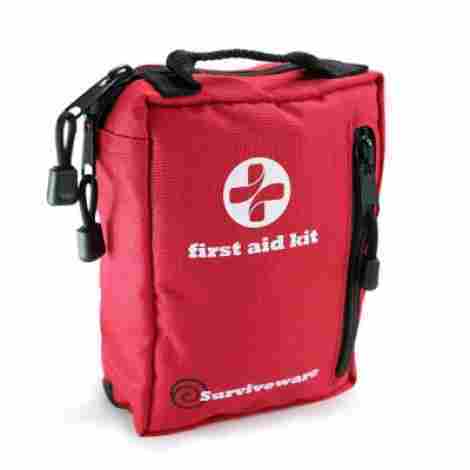 This is the First Aid Kit Hard Red Case from Be Smart Get Prepared. 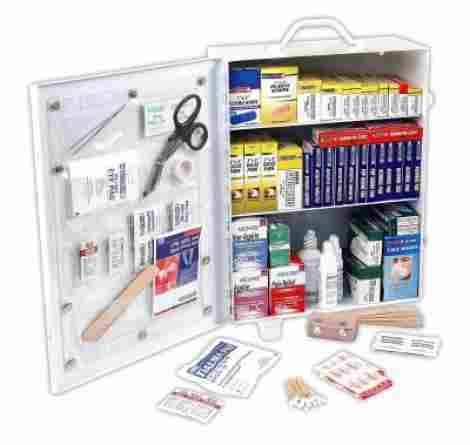 One great aspect to consider of this kit is that it comes with two separate layers of first aid, large and small with this, it comes with a tilting shelve that allows for easy designing and easy access. The large items are intended for adults while the shorter items are intended for little kids. They are very easy to refill and the easy glide latches secure lock into place. The case of this particular product happens to be a highly durable plastic case. However, one of the highest quality benefits is that it comes as a wall-mountable case that is ideal for any home office, school or home. With this, the wall-mountable qualities make it a great case to consider if you want premium value and an easy to access design. As the perfect travel and at home carry case made of durable plastic, this product is designed to be easy to recognize what item is needed during emergency moments. With this, the overall design is ideal for any individual wanting a tough case. It may be a bit hard to travel with for long periods at a time because it is rather large. To add to this, the plastic material makes it heavier compared to a carry case made of polyester of nylon. Fully organized shelves with compartments for easy storage. Two separate layers for large and small. Does not include anti-itch cream. Does not include surgical mask. This next selection of emergency equipment is designed from one of the most trusted brands. This product complies with the Ansi and Osha professional standards and it is designed to be environmentally safe and FDA registered. We want to chat about the Thrive First Aid Kit and what individuals will like from this set of emergency gear and items. The material of the bag may be one of the most beneficial to consider. The material of the bag is a rip-stop and vinyl fabric that is lightweight, compact, and designed to hold everything together very well during life’s unexpected moments. With that, the fabric is designed to be water-resistant and even has a reflective cross logo so it is easy to find in the case of emergencies. 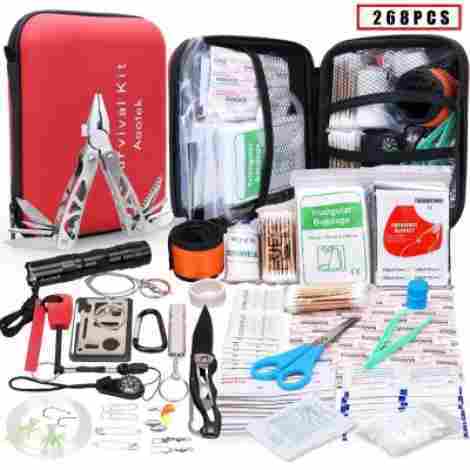 This kit has 291 extremely useful tools in the case of emergency. T comes with bandages, pads, trash bags, PVC gloves, cleaning wipes, and an ice pack. To add to this, it comes all very well organized and designed so it is easy to recognize what are the most important items and what you need. To add to this, it also comes with burn gel, cotton balls, and much more important items. To discuss the price and benefits, this product is designed for effective use and easy carry. The bag is not bulky at all, making it easy to carry important items and individuals can assume the design to be very organized. Overall, this is a great kit for any individual traveling on the go and wanting plenty of gear. It comes with inner pockets, a quality strap, and water-resistant zipper. Comes with 291 useful tools. Missing a couple of essentials. The organization could be better. This next quality set of emergency equipment is designed for at home use and happens to be great for kids. However, you can easily pack it in your duffel bag or golf bag as well. This particular kit has many essential for adults, but it comes from a brand that caters towards babies and kids. So, if you are taking your child to the golf course and you want to make sure you are covered in the case of an emergency, this is the kit to get. This is the Johnson and Johnson All-Purpose Kit. You never know if Timmy is going to start playing with the clubs and spray his elbow or if Sherryl is going to scrape her knee rolling down hill towards the green. Therefore, this kit is crucial. This set of great and beneficial equipment comes with 140 fully approved and certified products geared towards healing wounds, preventing infections, and aiding during emergencies. Other than the features, you are getting a set that is designed by one of the leading brands in the emergency field and field for children. This set is a high-quality set by one of the top selling brands of today. They have a history of quality and durable products that are beneficial for everyday use. Whether you need a band aid or to cover up a wound, this kit has it all. What is the most unique about this set is that individuals have the choice to choose from 36 products to 125 pieces to 140 pieces. This brand gives you the option to choose the ideal set for you. Whether you want a quality all purpose set, or a set that is separated, it is up to you. With that, the price is this brands dedication to keeping important and emergency items affordable for everyone. Options to choose your set. Comes with plenty of important items. 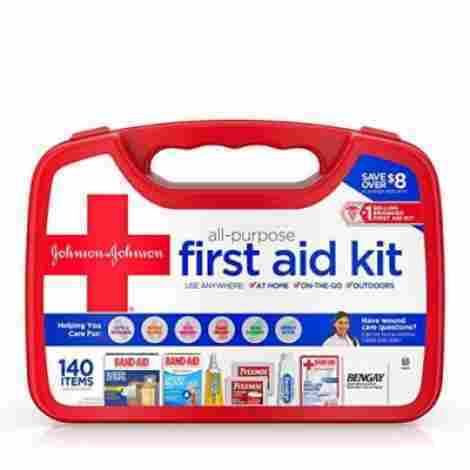 #1 selling first aid kit brand. Durable case and easy to snap shut. This next kit happens to be a highly professional kit that all professional individuals should have. In fact, this may be the kit that the office manager in your golf club has. This kit is an 800 piece kit that is wall-mountable and extremely high quality. The reason being is that it is particularly designed for business and emergency personnel. However, it is sold to consumer, moms, dads, and all individuals. This is the Rapid care First Aid. This particular brand allows individuals to choose their specific design of the kit. Since the kit is intended to be wall-mountable, the kit itself comes with metal cabinets. With this, it is ideal for job sites, home, and office environments. It is important to keep in mind that the more shelves you choose as far as your kit, the more products it comes with. Since it is wall-mountable, individuals can select expert installation during the delivery process. Since this product is considered a professional grade product, it is designed for office environments. Therefore, it happens to be designed to be fully compliant with standard emergency regulations such as Ansi or Osha. Alongside this, business owners can expect it to cover from 100 employees to 250 employees in the case of emergencies. As far as the price, this product is effective, high quality, durable, and designed to be easy to mount. To add to this, the design is a fully compliant and quality design that meets federal regulations. Eveyrthing from the packaging of the products to the moisture resistant case is very high quality. We consider this product effective and quality designed. Three design choices to choose from. Designed for at home or professional business use. May come a bit disorganized. This next kit may be considered the smallest kit on our list. 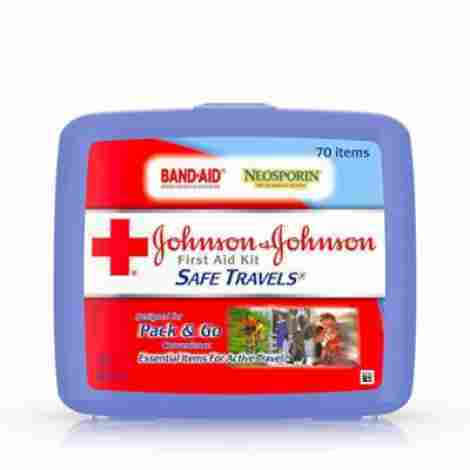 This next kit is the Johnson and Johnson Portable kit and it happens to be made for wound care and minor emergencies. It is important to recognize that the design is a 70 piece set, which is perfect for kids and parents on the go. Here is what it comes with. Since this kit is portable, the case happens to be small and easy to carry case. With that, it is organized very well and conveniently designed. It comes with plenty of essentials and important items to consider. Lastly, the case is durable and wear and tear resistant. The inside of the case is a small storage case. With this, it contains many items that individuals will need during emergency situations such as cleaning wipes, ointment packets, gauze pads, and more. It is essentially designed to prevent infections in the case of minor emergency situations. To discuss the cost, this product is the most affordable so far. Essentially, the less you have and the smaller it is, the cheaper it will be. The reason some kits are costlier is that they have hundreds of important items. This kit is very simple and as we said above, designed for minor emergency use. Quality kit that is durable and high-quality. This last product on our list happens to be a full survival kit in case of zombie apocalypse or emergency hiking situations. In any case, it is convenient, comes with plenty of perks, and it is designed with many features that we have yet not shared. This product includes everything you need to live in the wilderness or heal a scrape that happened on the golf course. This is the Survival Kit from Aootek. This set comes with much more than just medical wipes and gauze. This set comes with spring pliers, wire cutters, saw blade, key buckle, a large knife, and even a flashlight. 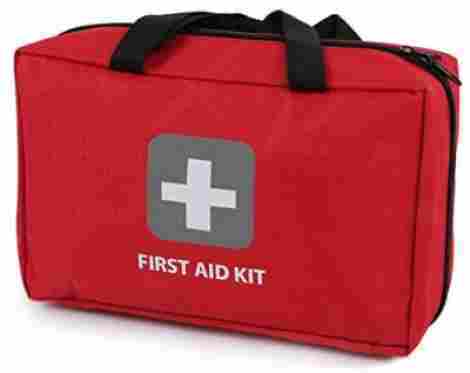 With this kit, individuals are covered when it comes to emergencies and safety. With that, it may be a bit much for the golf course, but if you need to rig your golf cart, you can. To add to the other lengthy features of this product, it comes with the basics of emergency prep. Users can expect it to come with items for natural weather situations, medical grade emergencies, and relief and prevention of infections. With that, the kit comes in a case that is fully waterproof and made of a durable hard exterior that is built to last. As far as the price, you would think for all of the benefits it would be costly. Well, it actually is not. It happens to be well below the price for many emergency kits and it has double the contents. For the design and the value, this product is of high quality, designed to last, and very effective. We recommend it if you want valuable benefits and a stylish and comfortable design. Quality design with plenty of important items. Comes with flashlights and wire cutter. Some stuff you may not use. Some stuff is made cheaply. Whether you are looking for a small or a large kit for a group of people, we have shared ten quality products with our audience. We believe that all of these are some of the highest quality to consider and they fulfill the purpose of being well designed and offering plenty of great items that are needed in many different scenarios. Now, let’s move forward and discuss with our audience the criteria that we used during the evaluation process. As the first aspect, it’s important to assess the quality of the exterior of the product. The exterior will determine how well constructed the product is – and what type of environments it could last in. The reason For this alone, we want to share the most common materials of the exterior. These four materials are the most common and they all have different design benefits and purpose. Plastic and stainless-steel is extremely durable and creates a very high-quality design. Most of the time it has a snap or some kind of closure lock system that allows for the product to be displayed in a bathroom without the contents falling out. The other two materials are actually made of fabric and allow for the kit to be more portable. Nylon is more durable than polyester because it tends to be rip resistant. Polyester and nylon both have moisture-wicking and water-resistant design benefits as well. When considering the exterior material, you also want to consider if the product has zippers are not. Reason being is some have zippers for added storage, or the zipper for the main compartment tends to be water-resistant as well. As the next aspect, if we are talking about the exterior, we also have to talk about the interior. This criterion is important to evaluate because there are many different types of emergency kits in the industry all with different interior styles. For the purpose of this article and topic, we shared a wide variety of different interiors. However, we find the labeled interiors that are most organized to offer the best quality and value. Reason being is that the labeled interior allows for an individual to easily recognize where the most important contents of the kit. It also allows for easy organization because you can replace a specific item and place it right in the same place. This is more beneficial than most kits which happen to have everything organized together in one packaging without any real labeling. With this said, the quality of the interior is also important as far as moisture resistance. Many interiors tend to be moisture resistant because they have important items such as gauze, bandages, and small scissors or items that can rust easily. However, now that we have covered the quality of the interior, it is time to move forward and talk about the contents of the interior. As the last criteria,, we obviously had to look at the contents and the benefits of each particular kit. With that, our primary intention was to share variety. So, golfers will notice that there are kids’ sets with a maximum of only 70 pieces and there are also major sets with a maximum of 400 pieces. Now, when evaluating the contents we wanted to ensure that everything was of the best possible quality. For instance, you may want to consider a set with high-quality stainless-steel scissors, clippers, and other gear compared to a set that has plastic scissors or clippers. Also, it is important to consider how well designed all of the other elements are such as gauze, the bacterial wipes, bandages, tissues and more. Even the packaging is an important factor. As far as the contents of the interior, we want to share a list of the most important items that every individual should have in their kit. These are only some of the major and most important aspects of a quality kit. With this in mind, you can create your own emergency kit at home. However, it may be most costly to buy everything from scratch compared to purchasing a quality kit. We hope our criteria have shed some light on different important aspects to consider and we want the chance to answer some of the most vital and key questions individuals may have. Q: Is the kit waterproof? A: Yes, there are kits that are specifically 100% waterproof because they are intended for boating or anything on the ocean. With that, many kits are designed to have waterproof packaging in the case you have to take it out in the rain. Q: Is the kit fireproof? A: Most fireproof kits tend to be made of a very high quality and flammable-resistant material. With that, the kits we have shared are not fireproof, they are primarily for outdoor sports or adventures. Most kits do have the fire-related emergency equipment. Q: Do I get to pick what comes in my kit? A: No. If you buy a prepackaged kit, you only get what is inside of the kit and that is it. If you are seeking a specific item inside of your kit, then it is important to evaluate what is missing that you desire to have inside of the package or bag. Q: Can I hang the kit on the wall? A: Yes. None-fabric designed kits. So, kits that are made of stainless steel or plastic can actually be hung on the wall and are easily mountable. With this, you may have to buy the specific equipment and tools to be able to hang it up. Also, ensure that the one you are buying is specifically designed to be hung on the wall.